Tarot vs. Lenormand: What's the Difference? "A linguistic system is a series of differences of sound combined with a series of differences of ideas." What's the difference between the Lenormand and Tarot? Traditional tarot decks consist of 78 cards that are divided into 5 suits: 4 elemental suits (earth/Pentacles, air/Swords, fire/Wands, and water/Cups), as well as a trump suit called the Major Arcana. This structure is not evident in the Lenormand deck, which consists of 36 numbered cards. While there are playing card images on many Lenormand decks, the suits are not taken much into account other than Aces are often good, and clubs are usually not so good. The court card inserts are sometimes used to describe people. Tarot tends to teach that "there are no good or bad cards; it's all in how it applies to the situation." As for Lenormand cards...well....there are cards which are inherently more detracting than others. Some are "good," some are "bad" and some are "neutral." Tarot cards tend to be read more as individual cards, Lenormands are read in pairs (or more). Tarot is more psychological, showing how people feel about situations, and attaching the moods to the context. It's our actions, the "verbs" of life. It's "why" we do what we do and how we think. For the Lenormand, it's more objective about what people are doing and the results, a more objective view of the nouns in the situation rather than the verbs. It's like watching a chess game: who is doing what to whom. It is more like seeing things above, with less context required in the querent's question because the context is in the reading itself. Tarot is more psychological -- you feel situations. Lenormand is more physical -- you see situations. Or maybe a better way to say it is that tarot is more an internal exploration of our moods, and Lenormand is an exploration of the outer world and its happenings. I've heard some people say that tarot cannot predict. I disagree. I've done many, many predictive readings with tarot, and the results have been powerful. But tarot predicts differently than the Lenormand. Tarot's predictions tend to be more psychological than mundane in nature. 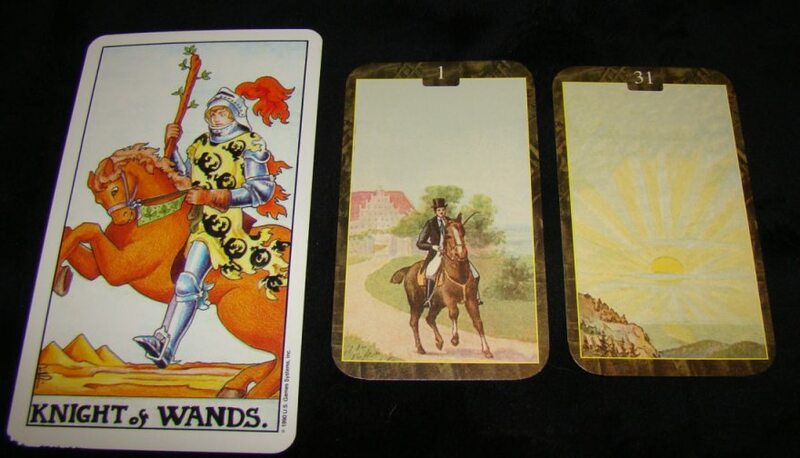 As with the Lenormand, the question for tarot is absolutely key when asking tarot to predict. But both can be powerful predictors, as long as we understand that they predict differently. Tarot tells you how you'll react/respond to the situation. For example, if you ask whether you'll get the job and receive the 5 of Cups, the sadness of this card implies disappointment and feeling sad regarding the outcome, so we use context of this sadness related to the question to connect that the answer will be "no." Alternately, had we received the 4 of Swords, this would suggest a sleepy delay or pause before getting the job, or that the boss is having a momentary hiring freeze or slow-down. Maybe it will impact your sleep (graveyard shift?). The 4 of Wands could mean yes, feeling celebratory about it, or you may receive the job offer shortly after a celebration/graduation from something, or a milestone. The 5 of Pentacles would suggest you'll still be feeling impoverished and looking for money, so we can then use context to indicate that the job won't likely happen, and if it does, the salary may be too low for you to accept. Tarot predicts from within the psyche. The Lenormand seems to predict more objectively, showing the external circumstances rather than the internal experience: Boom! You move out, the career changes, the money increases, you've crossed into a new path, consider this a lucky break. That's the Lenormand for ya'. With the Lenormand, the movement and actions of the people and players are described as if an outside narrator is observing them from above....sort of like a play-by-play sports commentary. Tarot gets INSIDE the people and describes the psychology of the players from their internal reactions and feelings about them. With the Lenormand you see it; with the tarot, you "feel" it. With tarot, you might get the 10 of swords for an ending (a painfully devastating one), while the Lenormand would give the same message through the more neutral Rider and Path (new direction, movement on). It might throw in a whip to add a "bite" to it if it wants you to know that the ending might smart. For tarot you must have the context to attach to the emotion to know what the card references. With the Lenormand, if you have enough cards, the context is there. Why would you need context in a reading? Did you ever have someone say, "Just give me a general reading"? Or... "Just show me whatever you see." This is tough to do with Tarot without a context (love, work, home, other relationships) to which we can attach feelings in a reading (as the Tarot will tell us how we feel about the situation). With the Lenormand, the context is already set up for you in the Grand Tableau spread. To some degree, I can do this with tarot, too, which is why I use a lot of cards in my readings. I have been pairing tarot cards in a line long before I ever heard the word "Lenormand." So for each tarot position, I lay down (usually) 4 cards from the same deck. I may even put a few more down to mix decks. Even my crystal readings blend meanings of rocks that touch. The crystal readings are closer to the Lenormand in flavor, even though I've throw in some stones to represent tarot card meanings. Most tarotists read tarot cards in singles, meaning one tarot card will give you the answer, and the answer is often paired with the position meaning (a position represents the situation, the outcome, the advice, etc.) or the question posed. Lenormand cards are almost never read in isolation. They are designed to be read in pairs. The pairing that takes place in Lenormand readings has already been inherent in my own tarot readings, but I think my readings are not the usual way of reading because I use so many cards to arrive at an answer. 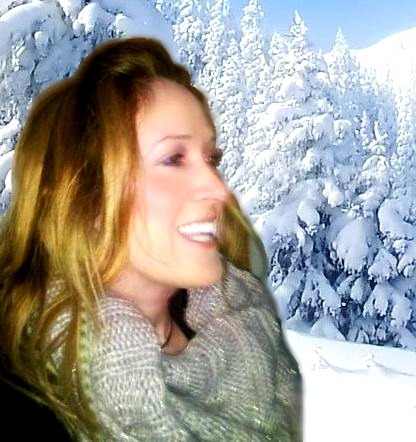 I blend multiple cards in one tarot position to create a single meaning or situation. Most readers do not do this. But it is possible. Most tarot readers will arrive at the answer using fewer cards, often just one. With the Lenormand, there are also ways of bouncing around within a spread (mirroring, knighting, using the houses) so that you can continue to see more and more layers by blending different pairs of cards all over the same spread. For those readers who get deeply involved with the Lenormand, there is the Grand Tableau spread, one that uses all 36 cards of the deck, and into which you can find almost any aspect of your mundane life explored. Most oracles (runes, crystals, angel cards, oracle cards) are read from the psyche, where you can go off on any tangent that you "feel" or "see" internally, and that is assumed to be the direction in which the reading is meant to go. The Lenormand, however, is stricter if you choose to adhere to the true tradition of the oracle. Cards are read in a more structured format, without going into so much depth within each card. Some things such as character expressions, directionality, and colors or people in a card, so important to a tarot reading, will have nothing to do with the Lenormand translation whatsoever. If you cannot see the above video, CLICK HERE. Would you like to learn more about how to read the Lenormand? CLICK HERE. And follow our updated Lenormand mini lesson podcasts HERE. P.S. A funny note about the cards pictured at the top of this blog: they have a lot in common in their vibe....I did not deliberately pull them. The cards were drawn randomly and were just the first ones I drew from the decks! Here's wishing you a magical week of cool card comparisons!